A recent article by Hassan Hassan and Ola Salem in Foreign Policy- under the headline "Arab Regimes Are The World's Most Powerful Islamophobes"- has provoked considerable controversy. Personally, I feel it is worthwhile to wade into this debate, in part because the article raises larger questions about applications of the terms 'Islamophobia' and 'Islamism'. In sum, the authors argue that some Arab governments (particularly the UAE, Saudi Arabia and Egypt), driven by their opposition to Islamists and seeking to justify their domestic political agendas, have contributed to an atmosphere of anti-Muslim bigotry (i.e. what would be defined as 'Islamophobia') in the West. Specifically, they argue that these governments go beyond "an effort to simply explain the precise threats posed by Islamists- which do indeed exist." Instead, they engage in "scare tactics to play up the threat" and freely tar their domestic opponents living in exile in the West with labels like jihadi and Islamist. These governments are similarly concerned about "powerful Western Muslim activists and politicians." In promoting their agendas, these governments and some of their supporters "have forged an informal alliance" with promoters of anti-Muslim bigotry on the right-wing of the political spectrum. Much of the negative reaction to the article seems to be based on looking at the headline and misreading the authors' thesis outlined above. The headline, to be sure, is a bad one. Hassan and Salem do not claim that these Arab governments are themselves 'Islamophobes'. Indeed the proposition is an absurd one, considering that they all privilege Islam as the religion of the state. However, the headline is the choice of the editors of the publishing outlet, and the authors should not be held responsible for it. In truth, focusing on the headline is a distraction from the article's content. Beyond the headline, an objection raised is that the authors are supposedly equating opposition to Islamism with opposition to Islam. This claim though is a serious misrepresentation of the article: had they actually been making this absurd argument, they would not have mentioned the issue of "precise threats posed by Islamists- which do indeed exist." It would also mean that Hassan in particular would be damning himself as opposing Islam, since Hassan has a long-standing record of criticizing the idea that the likes of the Muslim Brotherhood and the Salafi Islamist group Ahrar al-Sham in Syria are viable alternatives to extremism. Instead of constructing silly strawmen, a critique within the bounds of reason would accept that the authors' thesis is as I have outlined, but perhaps argue that the supporting data points they draw on do not sufficiently support their conclusions. Here, the door is opened for a wider debate on the manner in which labels of 'Islamophobia' and 'Islamism' are applied. In my view, the most compelling example the authors cite for their case is the issue of the rise of Muslim politicians and activists in the West. On the American scene, two Muslim women- Ilhan Omar and Rashida Tlaib- have become members of Congress. In so far as one wants to debate the merits and flaws of the political positions of Omar and Tlaib on substantive grounds, there is no problem with doing so. There is nothing bigoted about e.g. criticizing Omar's views on U.S. relations with Saudi Arabia, the Venezuela crisis and Israel. Yet there is a difference between those substantive criticisms and portraying the rise of Omar and Tlaib as part of an Islamist/Muslim Brotherhood-infiltration conspiracy and reflective of an alliance between the U.S. Democrats and Islamist movements. This is the portrait that was conjured up in an in-depth article in the Saudi-owned al-Arabiya outlet, as Salem noted in an earlier article. If I assert that a person is an Islamist, it means that said person supports implementing Islam as a political ideology on the state level and wishes for Islamic law to be the main or sole source of legislation and rulings. Common tropes include implementing the ruling of God's law (tahkim shar' Allah), rejecting 'man-made laws' and the like. In the American context, an Islamist outlook is a serious problem as it is at odds with the U.S. political system, which separates religion and state. But asserting someone is an Islamist requires proof that the person's outlook and intentions are as described above. The proper way to prove the assertion is through statements the person has made. One cannot throw that label at someone simply because that person is harshly critical of Israel (and perhaps promotes anti-Semitic tropes in expressing those criticisms) and is praised by members of the Council on American-Islamic Relations. Wearing a hijab and believing that wearing it by choice is 'empowering' are also not proof that a person is an Islamist. In other words, the term 'Islamist' has an exact meaning and cannot simply be used to refer to a Muslim person whose views on some issues one may not like. In fact, any objective assessment of the views of Omar and Tlaib would put them in the 'progressive left' trend in U.S. politics- something that promotes concepts like economic and social justice, 'intersectionality' and critiquing the U.S. role in the wider world. Regardless of what one thinks of these views, they certainly do not make Omar and Tlaib Islamists. For example, Omar's promotion of 'LGBTQIA+' rights is incompatible with an Islamist outlook, which would never countenance the idea of rights for homosexuals and other sexual minorities. What the al-Arabiya article does is to point fingers at a supposed Islamist conspiracy where there is none. By portraying Omar and Tlaib as Islamist agents, the article creates unwarranted suspicion that they have a subversive and sinister agenda. If 'Islamophobia' is reasonably defined as irrational fear and distrust of Muslim individuals and communities, then it is fair to say that the al-Arabiya article is an example of contributing to Islamophobia. This point is exactly what Hassan and Salem meant. They did not suggest that having critical discussions about Islamist ideology or even aspects of the Islamic religion and doctrines constitute Islamophobia, a term that can potentially be abused in such contexts. Rather, by Islamophobia, they are referring to simple anti-Muslim bigotry and irrational fear and distrust. Ironically, one negative response from the self-styled 'Muslim reformer' Zuhdi Jasser to Hassan and Salem is an exact reflection of the authors' thesis in the Western context. Just as it is absurd to claim that the Arab governments are Islamophobes, so it would also be absurd to call Jasser an Islamophobe. I have no doubt that Jasser is sincere in his identification with Islam as a religion and his belief that there needs to be 'reform'. Like everyone else, he is entitled to raise substantive discussions about concepts like armed jihad without being called a bigot and Islamophobe. 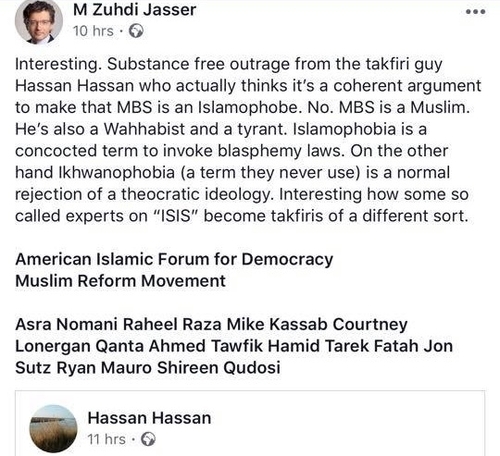 The problem with Jasser's response to Hassan and Salem though is how he throws labels like 'Islamist' without supporting evidence and contributes to wider fear and distrust of Muslims in America. In one Facebook post (photo above), he even has the audacity to call Hassan a 'takfiri' (i.e. that he is supposedly prone to pronouncing other Muslims to be non-Muslims, as the Islamic State does). Does Jasser even know what the term means? Or is it just a childish swipe at Hassan because he co-wrote a book on the Islamic State? Jasser did not stop there though. On his 'Reform This' podcast, Jasser engaged in an extended rant that precisely illustrates the points I have made above. For example, he refers to Ilhan Omar as an 'Islamist' without supporting evidence. As part of his case against the 'Islamist' congresswoman, he attacks Omar for her visit to Eritrea, absurdly claiming that the Eritrean government suppresses the rights of women and minorities in the name of Islamic law. In fact, even superficial research shows that the Eritrean government is devoid of religious ideology in its dictatorial behavior. Like Jasser, the Eritrean government labels Muslims who oppose it as extremists. Here then, is a precise example of how a potentially legitimate criticism of Omar (i.e. visiting Eritrea and being mute in criticisms of certain governments) is abused to portray her as an Islamist. Later in the podcast he turns to the article by Hassan and Salem. Besides misrepresenting its central thesis as portraying the Saudi and Emirati governments as Islamophobes, he describes Hassan and Salem as 'Islamists', characterizing them as part of a wider effort to mainstream 'Islamist' opinions in American discourse. In listening to this podcast, I was reminded of a segment on Fox News in which Jasser appeared alongside the Arab-American Muslim comedian Dean Obeidallah. Towards the end of the segment, Jasser addresses Obeidallah, saying: "But here [in the U.S.], us reformers are the victims of you non-violent Islamists." Regardless of whether one likes Obeidallah as a comedian and political pundit, it is truly laughable to describe him as an Islamist of any sort. To repeat, it is ridiculous to claim that Jasser himself is an Islamophobe. However, by throwing around the label of Islamist so freely and exaggerating Islamist influence in the U.S., he contributes to wider fear and distrust of Muslims. It is therefore little surprise, as Obeidallah retorted, that Zuhdi is "rejected by our community." I found the article by Hassan and Salem and the responses to it an important lesson on the need for precision in use of terms like 'Islamism' and 'Islamophobia'. These are terms with specific meanings and cannot be used carelessly to demonize one's opponents. Of course, Hassan and Salem are guilty of no such thing. Some of their critics, however, are simply confirming the main points in their article.